Drunk driving kills nearly 30 people in the United States every day. In Texas alone nearly 1,200 people died in drunk driving crashes in 2017. Needless to say, drunk driving is a significant source of human suffering, and a serious crime. At Sutliff & Stout, our Houston car accident lawyers try to encourage responsible behavior and prevent drunk driving tragedies by paying for sober rides on major holidays. 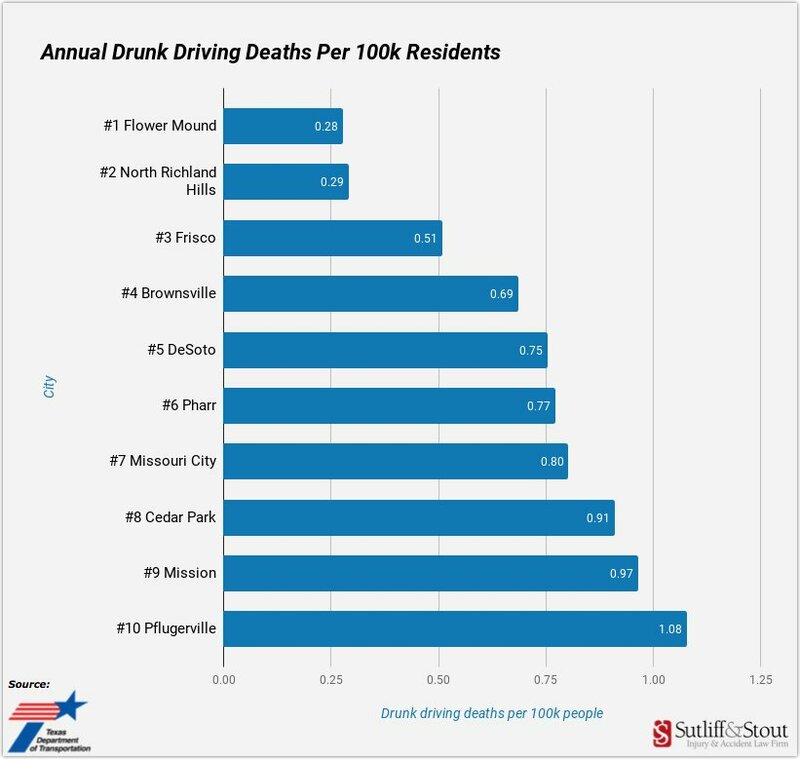 Despite the efforts of educators, law enforcement, and countless non-profits, the problem of drunk driving persists and some Texas cities are especially prone its devastating consequences. Given their size, it is obvious that Texas’s largest cities like Houston, San Antonio, Dallas, and Austin experience the most total drunk driving crashes and deaths. However, when you look at the numbers on a per capita basis, the results are surprising. 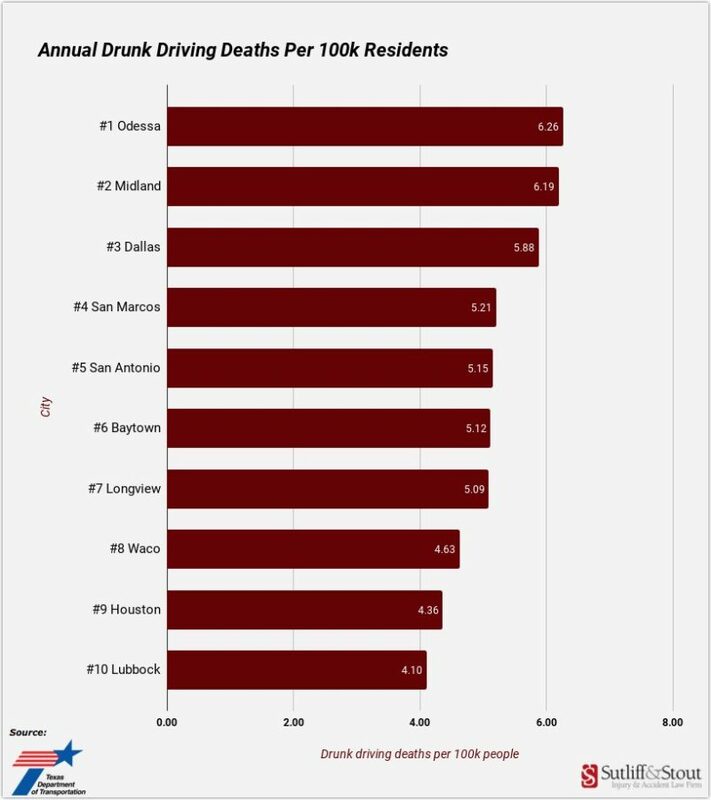 Based on the last five years, we have ranked the top 10 most dangerous cities in Texas based on drunk driving fatalities per 100,000 people. Odessa tops our list of the most dangerous Texas cities for drunk driving. Despite having a relatively smally population of just over 115,000 people, there are over 200 drunk driving crashes in Odessa annually. Over 3% of those crashes result in fatalities and 3.4% result in incapacitating injuries. To find the number two city on our list you need only drive down the road 20 miles to Midland, Texas. Midland has a population of just over 130,000. It’s home to 185 annual drunk driving crashes. Those crashes result in roughly six fatalities and 10 incapacitating injuries every year. The Big D has the third highest rate of drunk driving fatalities in the state, and is the first major city on our list. With a population approaching 1.3 million, Dallas is a major city. There are nearly 1,500 drunk drives crashes in Dallas annually resulting in over 75 deaths and 145 incapacitating injuries. San Marcos – a small city of just over 60,000 people – comes in at fourth on our list. Located in between Austin and San Antonio, San Marcos is split directly in half by Interstate 35 and it is home to Texas State. These two factors contribute significantly to the large amount of drunk driving deaths. San Marcos is home to over 130 drunk driving crashes, three deaths, and nine incapacitating injuries annually. At number five is San Antonio, the second largest city in Texas, and seventh largest in the United States. San Antonio suffers through over 2,300 drunk driving crashes annually, which result in 75 fatalities and over 110 incapacitating injuries. The city of Baytown Texas comes in at number six, and has the second lowest total population of the top 10 cities on our list. Baytown is situated just northwest of the Trinity Bay in southeast Texas. Despite it’s relatively small population the city is home to around 75 drunk driving crashes per year. Those crashes result in four fatalities and 7 incapacitating injuries on average. Longview – located 130 miles east of Dallas – is another relatively small city with an apparent drinking problem. Coming in at number 7 on our list, the city has a population of just over 80,000, but is home to 96 drunk driving crashes, four deaths, and nine incapacitating injuries on average per year. Checking in at number eight is the central Texas city of Waco, which has a population of jut over 130,000 and is home to Baylor University. Waco is the scene of 162 drunk driving crashes, six fatalities, and 16 incapacitating injuries on an annual basis. 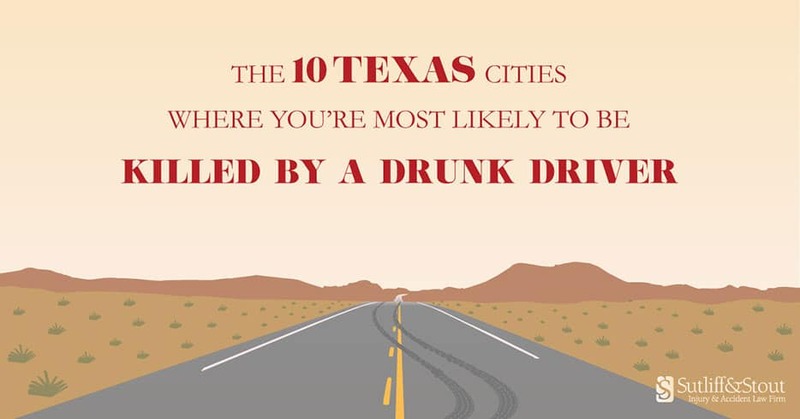 Unfortunately, our home and the largest city in Texas clocks in at number nine on our list of Texas cities where you’re most likely to be killed by a drunk driving. The Bayou City sees over 1,700 drunk driving crashes per year which produce over 100 annual deaths and nearly the same number of incapacitating injuries. Rounding out the top 10 on our list is Lubbock, a city with a population of a quarter million and home to Texas Tech University. Lubbock is the site of nearly 360 drunk driving crashes annually. Those crashes account for 10 deaths and 18 incapacitating injuries every year. Using TxDOT’s Crash Query Tool we obtained city-level Texas crash data for all Alcohol Involved Crashes (ie. drunk driving crashes) over five years, from 2013 to 2017.